catwalk pink is great! the colors look geat to add a nice glow. I also like the price tag- $3.99. i got the lightest pink one, and its such a big tub! i like it for little bits of highlight, like on my collarbone, and its creamy too, so you can put it wherever and it stays there! 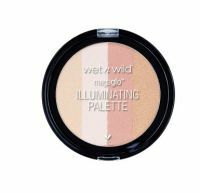 This is a great, creamy shimmery product that's multi-functional, and could be used anywhere on your body. Its a pretty big tin so this will last you a long time.